Learning about lawn grass diseases and what causes them are important for everyone who wants a great looking lawn. Diseases are opportunistic and once they get started can seriously damage or ruin a lawn. A little knowledge goes a long way. Traditional science and new approaches are gaining ground and are limiting the affects and spread of diseases. With grass diseases, preventative methods are extremely helpful, but quick action is often the best action once the disease has started. Read on to find out more. Pathogenic fungi make up the majority of the disease causing organisms. Fungi are naturally occurring micro-organisms found in all healthy soils. For simplicity purposes, they can be categorized as either "beneficial" or "pathogenic". The great thing is that the beneficial fungi groups far outnumber the disease causing fungi. In fact, beneficial fungi are so important to plant life, that they could not exist without them. Beneficial fungi live in and around the soil and perform hundreds of essential functions necessary for plant health. For example, they are vital to the breakdown all types of organic matter into elements plants can use. Other types of fungi aid the roots in nutrient absorption. Still other feed upon and suppress disease causing fungi. However, there a few types that can harm plants. They live in the soil, but fortunately they will only become a problem when the proper environmental conditions line up in their favor. Not all grass types are susceptible to all types of pathogenic fungi. For a disease to occur, three things must be in place. Correct environment conditions for disease development. If just one of these factors are missing, grass diseases cannot occur. To explain further, if a particular pathogen is present in the soil, but your grass type is not susceptible, then it will not become infected. In order for a disease to develop, the pathogen must have a susceptible host. Each species of fungi have specific environmental conditions they are active in. The pathogen will remain dormant until the humidity, soil and air temperatures and soil moisture content is in the correct range. Due to the wide range of environmental conditions across the country, some regions will experience greater problems with certain grass diseases than other regions. If a grass disease does begin, in most cases, as soon as the environmental conditions change to where it no longer favors disease development, then disease progression will stop. It could be a drop in humidity, a drop or rise in temperature or a period of no rain that allows the soil surface to dry. A healthy turf is better able to resist disease infection than an unhealthy one. The first step is to make sure you have the right grass type for your area. A grass that struggles because it is growing in a climate zone that is unsuitable will always be under stress. Sound cultural practices are just as important. Routinely mowing your grass below its lowest optimum level places it under a lot of stress. Adjust soil pH to meet the grass requirements. Proper irrigation methods performed at the correct times reduces opportunities for disease development. Fertilization also plays in important role in grass disease suppression. Developing a good fertilization plan that takes into account the grass’ needs and the environmental conditions where you live will go a long way in preventing disease. Organics have come a long way. Adding organic materials that promote the increase in beneficial microorganisms hold down pathogenic microbes. For example, organic biostimulants, such as AGriGro Biostimulants, have been proven to greatly increase beneficial soil bacteria and disease instances have fallen when used. Adding compost and certain organic fertilizers also increase beneficial microorganisms that promote healthy soil and grass. One of the most common mistakes people make is to over-fertilize during a disease period. Many people don't know what a disease looks like, so when one does develop, they add fertilizer and lots of water thinking that will help. Often, it just makes it worse. When it is all over, they are left with a major lawn repair job. But don't worry, this section will help you better understand what to do and how all these things link together. It is important to correctly identify the problem before treating it. Some turf injuries may resemble diseased grass, but may not be a disease at all. Dog urine can leave round bleached spots that may resemble dollar spot. 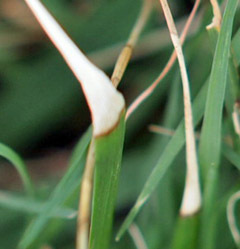 A small gasoline spill when filling the lawn mower can cause a bleaching injury on bermudagrass. There is also types of insect damage that can resemble disease, especially insects that feed on plant juices. If you treat an insect problem as if it were a disease, you will likely continue to have a problem. These pages will help you correctly identify disease damage and learn practices that will help prevent diseases from starting..
Profiles of common spring and fall diseases. Learn what they are, recognize disease symptoms, how to prevent them, treatment options and more. Profiles of common summer lawn diseases. Learn how to identify them, recognize disease symptoms, how to prevent them, treatment options and more. Never used a fungicide? While cultural practices are the best method of preventing lawn diseases, you may someday find it necessary to use a fungicide. It is important to know some basics about what they do and how they work for successful disease control. Safety for yourself and your family should be your main concern. This page contains valuable information about safe use, storage, personal protective equipment (PPE) and more. Fertilizing a lawn can be tricky if you are not sure how to do it correctly. Too much or too little can encourage diseases. Find everything from understanding fertilizer ingredients to calculating fertilizer rates to planning your fertilizing schedule for the entire year and more. Lawn Care Academy's list of quality products that will help you develop and maintain your lawn and garden. Interested in Seeing What A Biostimulant Can do For your Plants? See the Info Below. The small package good things come in. Bountiful Harvest is a powerful biostimulant packaged in smaller packages and can be used on turf and everything you grow. Foliar Blend is used by landscapers, homes and estates, farms, orchards, nurseries, and growers of all types in 49 countries around the world. Super-Cal provides in immediate source of calcium plants need for root growth, maximum microbial activity, disease resistance, and maintaining soil pH.